This was probably my most challenging project to date. Not just one, but three gardens, all on a sloping site. The upper floor of the house has stunning views across Rye Bay and the distant coast of France can be seen on clear days.Read more about the Battery Hill – Fairlight garden project and view the picture gallery. 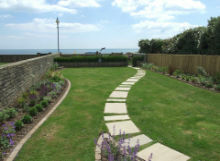 Enjoying a prestigious position opening onto the promenade and just metres from the De la Warr Pavilion, this garden just didn’t do justice to its location. 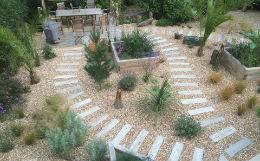 Read more about the Bexhill-on-Sea garden project and view the picture gallery. I was asked to redesign part of a large garden attached to an elegant Arts and Crafts house in Eastbourne. This area was at a lower level and had been planted with traditional cottage plants. However, it was rather overgrown, with a high hedge on one side. 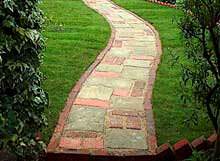 The only features were a straight concrete path and a couple of rickety rose arches. 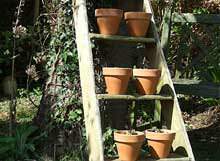 Read more about the Eastbourne Arts and Crafts garden project and view the picture gallery. On a quiet lane, overlooking the New Forest, this pretty Edwardian holiday cottage had an unusual garden. It had to be easily maintained, with seasonal interest and any planting near the boundary had to be proof against the strong winds and hungry ponies. 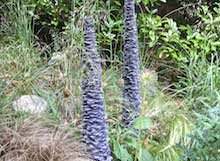 Read more about the Brockenhurst garden project and view the picture gallery. Blackrock House is a boutique guest house with sea views in Hastings. 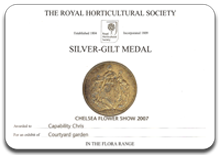 There is a small terrace at the front, where guests can enjoy sitting outside in fine weather but most of the planting was muddled and unsuitable for the location. Read more about the Hastings garden and view the picture gallery. This was one of the most challenging garden projects to date, especially as on my first visit the ground was covered with snow!Read more about the Appledore project and view the picture gallery. 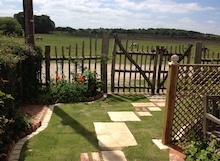 This was the garden of a recently converted Kent barn. 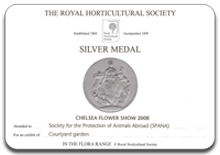 Little had been done apart from importing several tonnes of topsoil and laying a lawn. 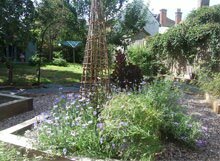 Read more about the Westwell garden project and view the picture gallery. Although the garden was already quite pretty, enclosed by the house and knapped flint walls, the planting lacked structure and harmony. 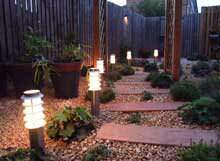 In addition the beds were bisected by a rather ugly L shaped concrete path made of old concrete slabs. 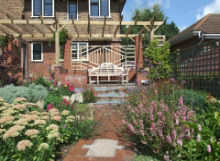 Read more about the Ditchling garden project and view the picture gallery. Although I love seaside gardens, this one was a challenge: A three storey new town house, north-facing, just back from the shore. The amount of winter sun it receives is limited, but it gets a reasonable amount in the summer and is protected from the wind by palisade fencing all round. 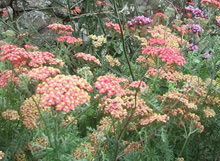 Read more about the Eastbourne seaside garden project and view the picture gallery. Although the garden was well-established and planted, it needed to look extra special for the wedding blessing of the client’s daughter in September. I proposed a newly laid Indian stone terrace to replace the old concrete slabs, with raised brick corner planters containing lavender and new planting. 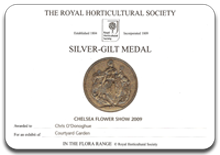 Read more about the Romney Marsh garden project and view the picture gallery. This client works from home and her visitors enter through a side gate and descend a flight of steps to access her consulting room. At the side was a rather barren sloping plot, containing poor, sandy soil and bordered by a high Laurel hedge. 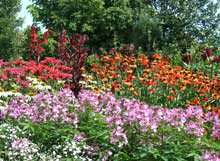 In addition, a large part of it only receives sun for part of the day so suitable plants had to be carefully considered. 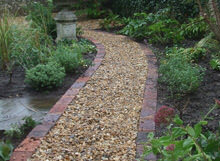 Read more about the Tunbridge Wells garden project and view the picture gallery. “I would like to recreate the Hanging Gardens of Babylon or at least a Moroccan garden, like the one you built at Chelsea” This from a London client who had a tiny roof terrace and an even tinier courtyard. 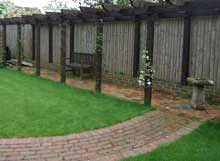 Read more about the West Hampstead garden project and view the picture gallery. In the words of the client, the garden was dull, the lawn weed ridden and apart from an old gnarled apple tree, it had no redeeming features. Therefore, the brief was to make it more exciting and visually stimulating while retaining the apple tree as a feature plus keeping the existing log store. 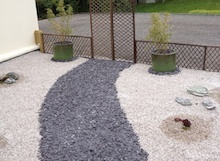 Read more about the Brenchly garden project and view the picture gallery. This small, established town garden was spoiled by an ugly central area paved with broken concrete slabs. Initially, the client wanted to replace this with Indian sandstone but I suggested instead that she had a lawn, which was more in keeping with the existing planting. Read more about the Cranbrook project and view the picture gallery. The garden consisted of a sloping lawn with a steep rockery running along its width and a very overgrown and uneven higher level. A small pond, also overgrow, lay at the left hand end of the rockery with a flight of concrete steps at the right. The client wanted to flatten the lawn and reduce the height of the upper level. Read more about the Haywards Heath project and view the picture gallery. This garden was worked on over a long period. It was already well established but the owners wanted to stamp their own mark on it and to develop the slightly wild feel. 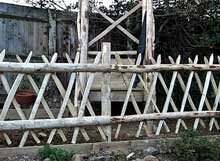 Chickens were allowed to roam free so the plants had to be robust and a small vegetable patch was secured, using fences from Shinglesea, to keep them out! Read more about the Benenden project and view the picture gallery.